I have an evil plan. I like to call it ‘how to get small boys to eat more vegetables without resorting to hiding them’. Like most plans, evil or otherwise, some days there is progress. Other days it feels more like regression. One of my recent ‘progressive’ days was when I made these Crispy Zucchini Fritters for Sunday brunch. I had already had success with potato rosti, so I figured crispy fried treats may be tempting enough for Fergal to overcome his moratorium on green vegetables. They were so popular with all my men there weren’t any leftovers. And when I suggested to my Irishman that they might make a nice St Patrick’s Day celebration, he agreed with the proviso that they be served with Guinness, of course. I find fritters a bit fiddly to make. They’re not the sort of thing to serve a huge crowd. But I’m happy to take the time on a Sunday morning for our little family so my boys are enjoying some vegetables rather than just scoffing the bacon or black pudding. Normally I’m all about the mayonnaise for dipping but after ‘extensive’ testing my Irishman and I agreed that the fritters are actually better with refreshing natural yoghurt or some labneh. 1. Grate zucchini using your food processor or a box grater. Add a pinch of salt, stir and stand for a few minutes. Pat with paper towel to remove some moisture but no need to get it really dry. 2. Combine the salted zucchini, eggs, almond meal and mint (if using) until thoroughly mixed – I just do this in the bowl of my food processor. 3. Heat 1cm (1/3in) oil in a large frying pan on a medium high heat. Test a little drop of mixture, when it starts sizzling vigorously, start scooping heaped tablespoons of the mixture into the pan. I usually cook 5-6 at a time. Shallow fry until well browned on both sides. Drain on paper towel and keep warm in a low oven while you continue cooking the rest of the mixture. 4. Serve hot fritters with a good dusting of sea salt flakes and cold yoghurt on the side for dipping / drizzling. with potato! – replace some o the zucchini with spuds. Or for a whole potato experience, these rosti are a total winner. different veg – if you can grate it, you can probably use it in place of the zucchini. Think sweet potato, potato, carrots, butternut pumpkin (squash) or parsnip or any combo of the above. different herbs – mint and zucchini are a match made in heaven but feel free to use some chives, parsley or even basil. nut-free – replace almond meal with ground sunflower seeds or use your favourite flour my choice would be chickpea flour. lighter – use 3 eggs whites instead of the whole eggs. burgers – form the mixture into 4 burger patties and pan fry in the oil until well browned and cooked through. baked – not as tasty as fried but definitely lower maintenance! Drizzle oil in a baking tray and top with scoops of the fritter mixture. Bake 200C until well browned – about 20 minutes as a guess. zucchini nests – use your spiralizer instead of grating. brunch! / more substantial – serve with poached eggs and a salad. A bit of bacon or black pudding wouldn’t go astray. Also see 16 Tasty Ideas for Zucchini. I’d love to make these fritters but freeze half for another day. Should I freeze it raw or cooked? Thank you for posting, I have wanted this recipe since I saw your pic of it on Instagram. I LOVE how simple your recipes are and how quickly I can put them together! AND mostly they are totally natural and very nutritious! The only thing I would request is the use of less sugar and perhaps substituting with honey, real maple syrup or stevia. AND have you ever used raw cacao instead of chocolate! I know – sounds like a huge mistake to substitute anything for chocolate, right? I LOVE chocolate, too, but with a little experimenting, raw cacao is fabulous! Keep up the great work and stay awesome! 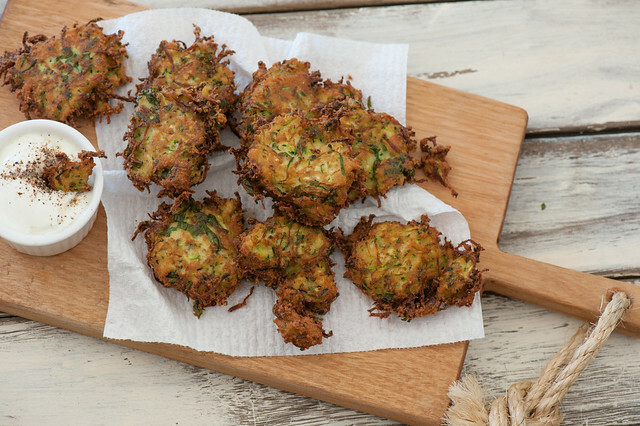 Oh – and I do love this new crispy zucchini fritters recipe! Thanks so much!!!!! Thank you for sharing this recipe, Jules! These look incredible! Sometimes it feels like a monumental challenge to get my 2 little ones to eat more veggies, but the like potato pancakes so I am definitely going to try these along with some of the variations. No I haven’t tried freezing Erin but sure it would be fine. And hang in there with the little ones – just keep offering. 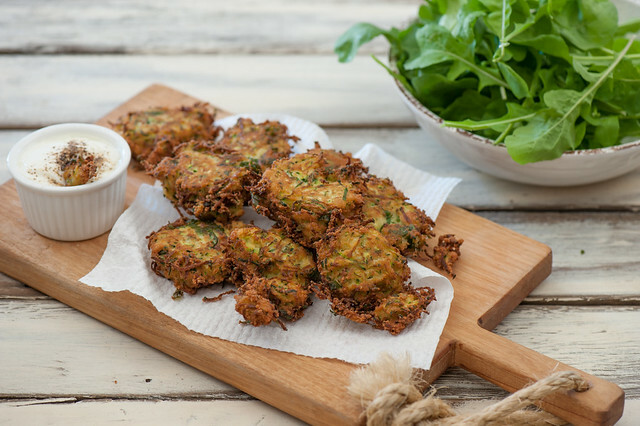 Your Crispy Zucchini Fritters look great but … OH WAIT ! it will be 6 months before the Zukes arrive in my garden here in Gold Bar which lies 54km NorthEast by East from Seattle Washington. Until September I guess I shall just continue swanning about your excellent site harvesting recipes from the alternate hemisphere. Thanks for another tempting recipe! I especially love the veggie ones even though it’s snowing and blowing here as I write. Would it be possible to include a link to a recipe for something suitable to the opposite season for us folks who are in the northern hemisphere? Zucchini is still just a dream……. Try carrots, parsnip or sweet potato Anne… you should have lots of root veg at your disposal! Yum! Thanks for the great variations for each of your terrific recipes. Such useable ideas; I love your site. Hi J. Been reading your website for a couple years now. It has been useful to gain theory on how cooking works so I can attempt to dive into cooking passionately myself one day. A nice potentiel area to cover would be cooking tricks and hacks and strategies that give adhd moms or teens a good approach to cooking with success. Your material already covers intuitive approaches to quick and interesting meals…think it would be of a great help to make a cooking training product to support adhd people seeing as you already teach a cooking approach that is more inline with adhd strengths anyway! Great work and all the best ? Dear Jules, This comment is not about the zucchini fritters, but about cooking rhubarb. I entered a comment some months ago about how using a pinch of salt instead of a much greater quantity of sugar, when cooking rhubarb, enabled me to cut down the sugar used (my husband has diabetes 2). Your assistant said she would pass on the comment to you but I’ve never received any response. I couldn’t find the right place to make a comment so put it in some place anyway. Obviously it reached her! Just wondered if you found this a helpful idea. Good to have quick tasty recipes with so few ingredients. Yay for real food Hanna! I am really looking forward to making these! Thanks! I have been reading your blog from its beginning and love it. Would it be too much for you to add a substitute list? Some of the ingredients are a bit pricey and/or hard to find and I am single so I try not to overspend on things I may not use very often. Thank you and Happy St. Patrick’s day to you and your boys!! What sort of oil did you cook these in ? My son is impossible. All he will eat is meat, he refuses to touch any vegetables. I’ll give this a go and let you know if it works! Interested to hear how you go Wai! I loved the simplicity. After taking a bite of Crispy Zucchini Fritters which i cooked yesterday, me become a fans of my self (not even a average chef). I wonder if i have the chance of a bite that you made, what will be the taste…… I really admire you for being so informative and sharing. Thanks. I love how simple and healthy your recipes are. I don’t have a lot of time to cook so your quick easy recipes are perect for me. I also love how few ingredients you use, many times I see recipes on other sites and the recipe calls for 15 or more ingredients! I also love the variations that you offer at the end of each recipe for different dietary needs because it’s nice to be able to adapt recipes. Thanks for the recipes! I love crispy foods and this seems mouth-watering! I tried the nut-free version of this and omg, so delicious! I love trying different recpies and your blog is my favorite. Thank you so much! I knew the minute I saw this recipe that I wanted to make them. They turned out really well – loved the advice not to stress too much about getting rid of all the water and it wasn’t a problem. I only had one courgette so scaled the recipe down but still made 4 largeish fritters. Excellent, simple and great for that breakfast/brunch extra when you want to cut down on carbs, as I find that finding the texture thing that (say) a hash brown or toast would add is missing. I think next time I will add something as I felt the flavour needed perking – maybe a pinch of cayenne or chili flakes? Or a bit of chopped spring onion? That’s the beauty of your recipes – so many tweaks possible! Thank you! Himself is out and I can choose whatever I like for dinner tonight hmmmmmmm? I guess zuccini pancakes will fit the bill very well ! !